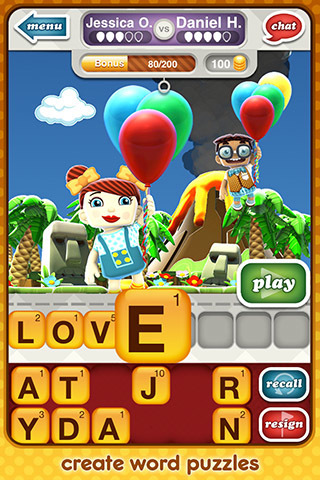 Social gaming giant Zynga recently released a new iPhone app called Hanging With Friends Free. Hanging With Friends is the game of Hangman made new again with some intriguing twists. Like old school Hangman, one person creates a word for their opponent to guess. Unlike old school Hangman, in Hanging With Friends you have to create your words from a random group of 12 letters, just like picking from a row of Scrabble tiles. Each player is represented by an avatar which is suspended in the air by five balloons. Every time you fail to guess your opponent’s word, a balloon pops. Lose all five balloons and your avatar goes skydiving. The avatars and the cartoonish scenes they float in front of are childish but understandable as Zynga couldn’t really have you hang from the gallows when you lose. The only disappointing part about the game is the coin system, which is a blessing and a curse. When you’re trying to guess your opponent’s word, there are three lifelines you can use to help you. Each of these lifelines costs 20 coins. You earn coins by scoring points with the words you create. Like Scrabble, each letter you use has a point value, and every turn you create a word a multiplier is placed randomly in one of the 8 spaces you have available. It’s a clever idea, and it creates a new layer of strategy in word creation. For example, you might try for a low scoring word that’s difficult to guess, a high scoring word that’s easy to guess, or a mixture of both. The problem is that you only get 20 coins for every 200 points you score, which can take many turns. If it was easier to gain coins the dynamic between creating a high scoring word or a complicated word would be much more exciting. Even with the imbalanced coin system and lifeline system, the game works. Games can get increasingly intense as you go back and forth with an evenly-matched opponent. As the duel wears on, you’ll have less guesses and less margin for error, but because of the creativity involved it never stops being fun. There are still some minor bugs to be worked out and the coin system needs fixing, but Hanging With Friends Free is a fresh twist on a classic game. If you’re a fan of word games, this is a no-brainer iPhone app to download. Note: The free version of the game is not the only one available, so if you want an ad-free version to buy you can purchase Hanging With Friends (iTunes $1.99). 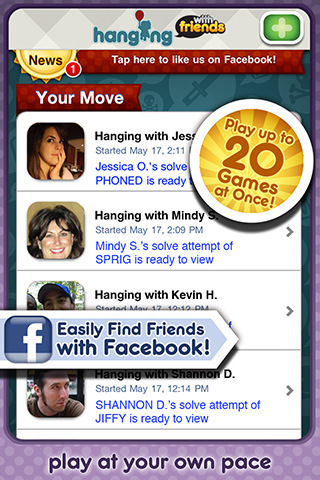 AppSafari review of Hanging With Friends Free was written by Darius Reimm on June 12th, 2011 and categorized under App Store, Free, Fun, Games, Puzzler. Page viewed 5692 times, 1 so far today. Need help on using these apps? Please read the Help Page. There are a couple of things that are stated incorrectly in this article. First, you get the 3 lifelines automatically but can only use one on each turn. There is an option to purchase more lifelines but it is not working yet. Also, the number of tries does not decrease as you go through the game. The number of tries is based on the length of the word. Long words get less attempts (probably because there are more repeated letters) and short words get more attempts. I Keep losing with 2 balloons still left. Why is that?